UPDATED (see below): Hey guys, these have hit the net so thought I’d show ’em off. Apologies a couple of them have corrupted slightly in the upload and I’ll try to fix that soon. Notice they actually have the amount of calories you’ll burn in each class at the bottom – however (in my opinion) the figure is pretty low. 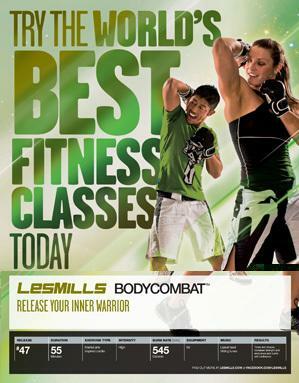 I guess Les Mills have erred on the side of caution and put minimum figures rather than over estimating to be safe – combat as an example has a figure of 545 calories – but my heart rate monitor never shows less than 800 calories burnt in a class – and often shows over a 1000! 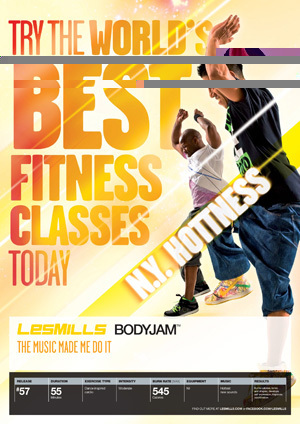 ^shouldn’t that be BODYJAM 56?? 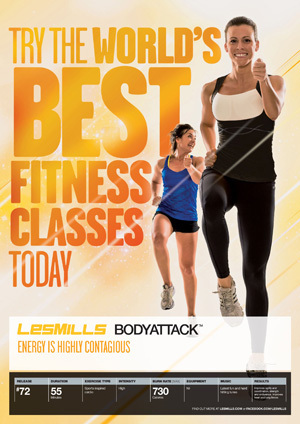 40 Responses to "2011-1 Les Mills posters"
But how cool are these posters! They’ll definitely pull more people into the group fitness room! Jam & combat same calorie output…interesting..
And pump higher than combat? Any chance to get corrected image? look closer, looks like it’s being incorrectly compressed. too low for BC…i guess it depends on how much energy one is releasing during the class…and one should try without the AC on…it’s hot combat!!! THEY ARE SO COOL!!!! Love the photography. But the amount of calorie burn are a bit underestimated, every time I do BC, BP or RPM, as an intructor, the HR Monitor hits at least 780. Really digging the new posters! No matter how hard I push myself in Combat, Attack is always a harder workout and I burn more calories. You don’t need no air conditioning to work your @$$ off in Attack! I definitely burn more calories in Jam than any other program… but I think the average *participant* would be hard-pressed to get that calorie burn. 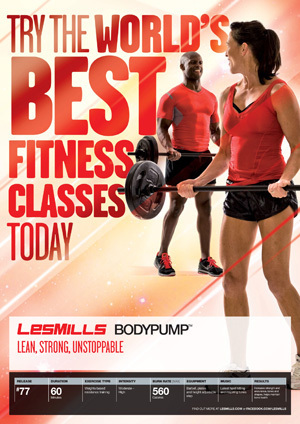 I almost think it’s “too bad” that they’ve fixated on the calorie burn for classes like Jam, Balance/Flow – or even Pump – because the OTHER fitness benefits you get from those classes are what make them amazing, IMO. Wow Erin highest in jam? And well, these amounts of calories burnt might be using low impact and low options, ’cause here in Brasil the RPM instructors say we can burn something between 750 and 1000 calories. OK maybe it’s just me but I don’t like them. The posters are average and the calorie burn just seems dumb. Why put a number on it? there are sooo many factors making it vary from person to person and class to class. Seriously 545 for combat? what did they do? stop for a cup of tea? There is no way I burn more in pump than combat. I think it’s degrading to the program to have it so low. I would also put step up with attack and combat at the top. Now the pictures: Combat – what is the girl looking at? her armpit or are her eyes shut? why does she look so serene? I would much rather see more action and facials to match like in 46. Attack – that neck angle at the back just looks uncomfortable and awkward. RPM and Pump I actually like. Step – it’s OK but abit dull – doesn’t excite or inspire me. Vive and Balance are OK.
Also agree it should be Jam 56. 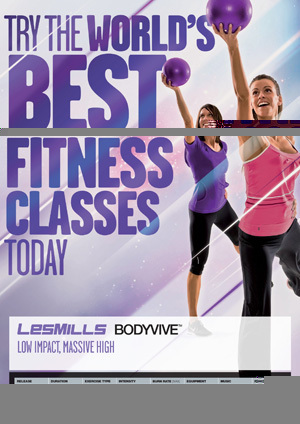 To be honest I think if you want to advertise yourself as “the world’s best fitness classses” (which I agree les mills are) you need to sharpen up on the posters. Ps – interesting I never knew BP was meant to be 60mins, thought it was 55 as all the others. Does that include allowing set up and put away time or is that start to stop? anyway sorry for the essay and thanks for posting Glen! Anna I guess the bodypump time includes the pack up. I ensure my classes run about 55 minutes but yep once the weights are put away its definitely 60. And not sure why they’re still claiming combat and attack are 55, the last couple of releases have been 58 and 59 minutes, without a break! Good grief just realised I wrote “aired on the side of caution” – “aired”?? What a goose – well it was late! Hi Glen, what about Sh’bam poster? No sign of it yet Eddie sorry! Ang Hunter = wotta hottie! YOU. ME. JAM WORKSHOP. I’ll do Combat as a compromise. Deal? I wouldnt say that what I do is Combat – more of a fusion of Attack and Jam while trying to look aggressive……..
Hi! It’s my first post here, although I follow this blog quite a while. Nice job Glen, thanks! OMG… I’ve just seen posters voor Sh’bam en Vive with the calories amount on them. Deeply shocked to see the number 600 on Sh’bam . Really?! No, REALLY?! 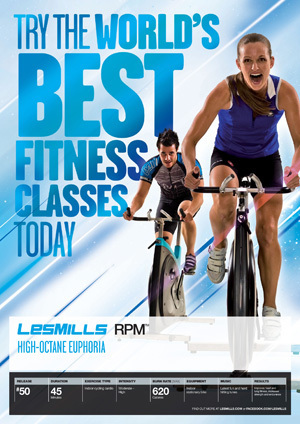 It’s fun to do Sh’bam (although I call it “a nice warming up”, since I’m used to much more impact than that), but no way I gonna believe that 45 minutes of this class will gonna cost you more energy than one hour of Combat or Jam, which are 545 Kcal both… (Argh..)! Well, I can understand they want to make a promotion to Sh’bam, but is it really the right way? I’ve never been to BodyVive (550 Kcal!! ), I have seen the videos though but still I don’t believe you can burn a bit more than in a Combat class there. I’ll try to post the Sh’bam poster here for the people who wonder. Hope it’ll work… If not – sorry Glen for making a mess! it all depends how much heart (quite literally) you put into, so I guess the numbers are average. Still, nioce to have numbers! LOVE the posters!!! o.O on the calorie burn though…. They really put the word – MAX over there! Not “Average”, or “From” or whatever! Arghhhh…. Now I got frustrated even more about it! Can’t believe than Sh’bam burns more calories than Combat?? I was talking to our Monday night combat instructor before class last week and he was looking at the BP poster and said most of the people on it have bad technique…. 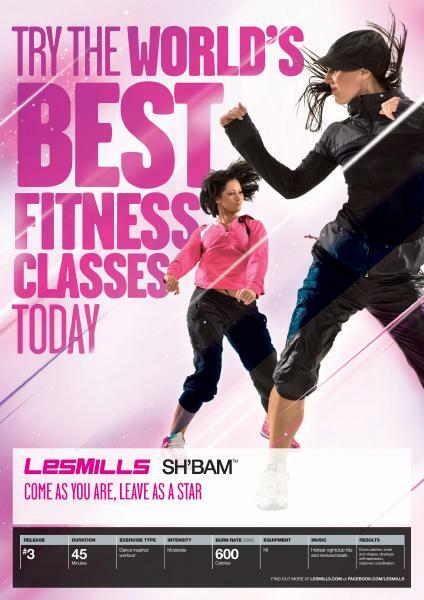 then I told him according to the Sh’bam poster – you can burn more calories than combat… he didn’t believe me at first, then announced this to the class and said next week (today) he will ensure that we burn double the calories – so I don’t know what mix he will do today…. Was wondering when will ya put up them corrected images. 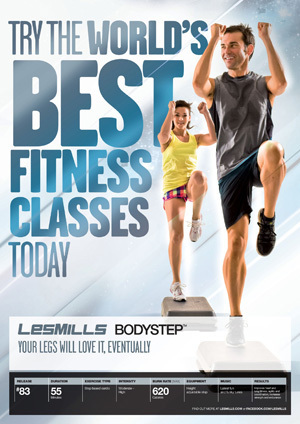 Les Mills just really gives us the best posters every release! Anyway, looking forward to the new challenges in BP 77! 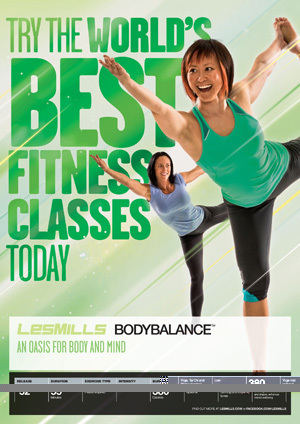 Do you know who the official photographer is for Les Mills? I know they use an agency Jessica – I don’t know which one unfortunately – BBDO perhaps?